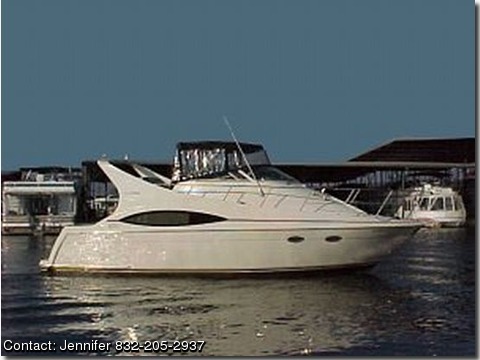 DESCRIPTION:Wonderful 1998 Carver 350 Mariner offered by motivated seller. The twin winding staircases leading to the helm frame the sliding door that steps down into the salon. She has been fresh water kept in a covered berth, and is in excellent condition. Equipped with generator, air, canvas, and MerCruiser 350 mag m.p.i., she is ready to take you and your family cruising into the sunset! This is the boat you've been waiting for! The covered slip in Walden Marina on Lake Conroe is in high demand and can be transferred with the vessel. With hours on the engines at less than 400 hours, this is priced to move quickly. Start enjoying the spring weather and high point of the boating season with more room and comfort. Large forward master cabin w/queen sized bed. Plenty of storage under bed & throughout cabin. Huge adjoining bathroom/head w/extra large shower/separate sink/vacuflush toilet. Numerous opening ports and hatches throughout. Spacious galley w/dual burner stove and oven. Dinette settee converts to double bed. Ships ladder interior access to upper bridge deck. Large L-shaped settee opposite from dinette that converts to double bed. Fireboy CO2 alarms forward & aft. Ice maker up on bridge deck. Spacious cockpit with dual built in steps to bridge deck. Pass-thru hatch from bridge deck to salon below with ships ladder. Sliding glass rear access door. This is the absolute perfect boat for cruising and entertaining. The upper bridgedeck can seat 8-10 people easily and the pass-thru hatch from the salon below is perfect for handing out snacks and drinks. You can sleep 6 in luxurious comfort down below. Why buy new when you can buy "like new" at half the cost?